This brilliant and innovative show, set in Victorian times, traces the steps of Olivia from downtrodden orphan to star of the stage. On her journey to the bright lights of London, she is befriended by Eliza Doolittle from My Fair Lady and, after a series of adventures, becomes a singer in a new Gilbert and Sullivan show, thanks to the unlikely assistance of Fagin and The Artful Dodger. 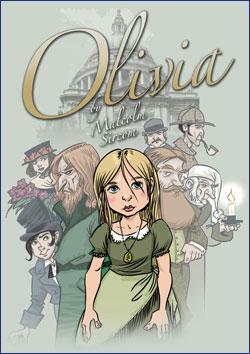 Olivia also meets George Bernard Shaw, Ebenezer Scrooge, Sherlock Holmes and Doctor Watson in a feel-good show that abounds with wit and humour, both in the script and the songs. Adults £10. Children (under 14) £7.50. All seats unreserved. Cheques payable to Broxbourne Theatre Company.